UPDATE (12/14/16): Found two of the three Jimmy Cox 78s (audio and pictures below). Interview with Cameron Devries and Billie Devries conducted September 2011. My name is Cameron DeVries and wanted to see if you would be interested in running an article of my grandfather, Jimmy Cox. Born in Illinois, in 1925, Cox’s family ended up in Colorado. At the age of 16, he lied about his age, and joined the U.S. Navy. In 1948 Fred Milton Cox began his radio career at KCSJ in Pueblo. 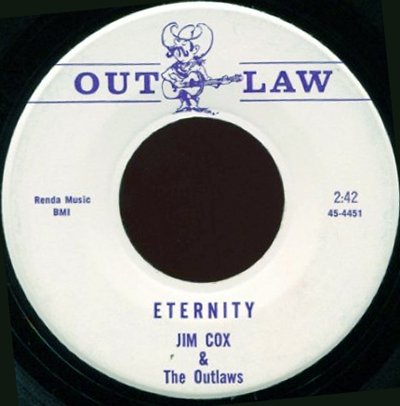 Using the name Jim Cox on the air, he was better known as Jimmy Cox, the Colorado Troubadour. Hear a sample of both "Can I Take My Pony to Heaven" / "Colorado Hills"
Hear a sample of both "I Look in the Mirror" / "The Orchid Reminds Me of You"
While holding down a job as an appliance salesman at Sears, he continued to perform both on the radio, and at bars around town. 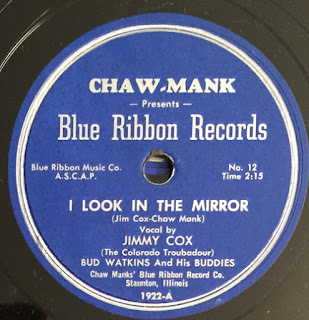 In 1952, Cox signed with Blue Ribbon Records, operated by Chaw Mank, out of Staunton, Illinois. 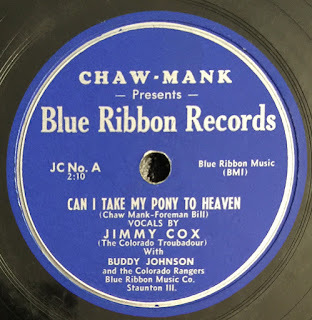 He recorded (at least) three 78 rpm records for the label, "My Colorado Hills Are Calling" / "Can I Take My Pony To Heaven" (with Buddy Johnson and the Colorado Rangers--J.C. A/AA), "I Had to Love You” (backed by Don Mason) / “Blue Ribbon Waltz “ (backed by Don Mason on guitar) - Blue Ribbon 1912 and “I Look in the Mirror”(backed by Bud Watkins and his Buddies) / “This Orchid Reminds Me of You” (backed by Gaylon Mize on guitar) - Blue Ribbon 1922. 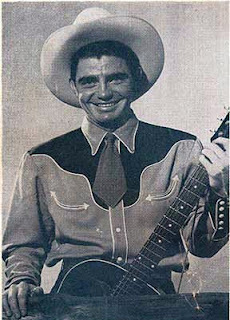 A quick Internet search finds that Gaylon Mize died in 1956. 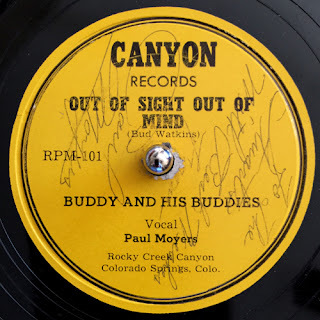 Bud Watkins was the Buddy in Buddy and his Buddies, who recorded on the Canyon label with vocalist Paul Moyers “Out of Sight Out of Mind” / “I Didn’t Even Cry” – Canyon 101/102, no information could be obtained on guitarist Don Mason. Hear a sample of "Out of Sight Out of Mind"
When KCSJ television signed on the air in 1953, the station was looking for local programming to fill the nine-hour broadcast day. They turned to Cox. Management had an idea for a children’s show to entertain the kiddos when they returned home from school. 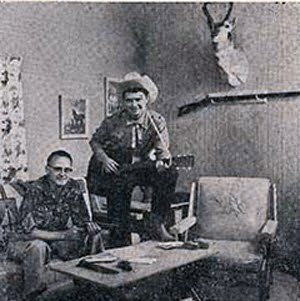 So every Monday, Tuesday, Wednesday and Friday afternoon, from 4:00-6:00, Jimmy Cox (and his sidekick Cliff Hendrix) would sing songs, play games, and introduce the popular “Howdy Doody Show." The “Time for Adventure” show, and later his music show “Colorado Hayride” were so popular that Jimmy Cox had his own fan club. For $1, admirers received a newsletter, a membership card, 8X10 photos, and four issues of Cox’s newsletter. The first 100 members received a free western tie, signed by Cox. 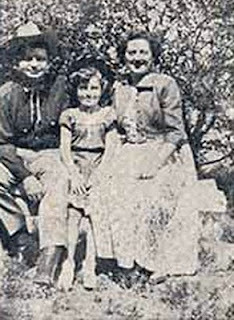 The first newsletter, published in the fall of 1954, introduced his fans to Jimmy’s family, wife Wilma Mary, and daughter Billie Marlene. Just six years later his TV shows ended, and so did Wilma and Jimmy's marriage. Wilma passed away in 1978. 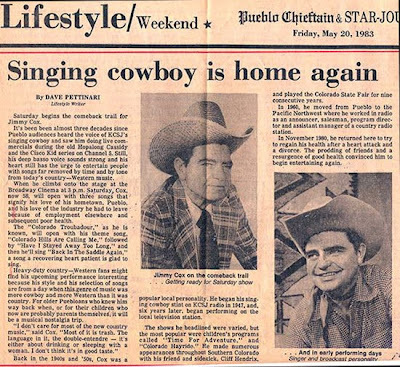 Before he left Colorado he teamed up with local country performers Jack Shiplet and the Blue Ridge Boys. By the way, Jimmy Cox is not be confused with Jim Cox and the Outlaws, the Casper, Wyoming country outfit who recorded around the same time on the Outlaw label (see record below). After 20 years away, Jimmy Cox returned to Pueblo in 1980, when he and his second wife divorced. He moved into a home on West 6th Street. It was a chance to reconnect with his now-grown children, and grandchildren. “We’d have him over to the house for family dinners, and it was a chance to get to know him again,” Billie Devries said. “He was enjoying playing when he came back. He played a the Uptown Theatre, and he got involved in the church downtown and played his guitar." On July 4, 1985 he died. He was just 60 years old. “He had problems with his health, and his family had a history of heart problems,” said Billie Devries. “He’s buried at Fort Logan cemetery." Jimmy Cox’s musical legacy lives on with his grandson, Cameron, who plays in the local band Double Down with Curtis Pacheco. He was previously in the rock band, Obsybian.